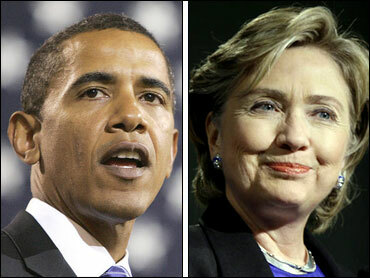 Sen. Hillary Rodham Clinton's votes and statements on war and torture should give voters pause, Democratic rival Barack Obama said Wednesday on the fifth anniversary of Congress' vote to authorize military force in Iraq. Former Sen. John Edwards chimed in with his own criticism of Clinton on the war. Obama, who was in the Illinois state Senate at time of the vote, said the New York senator now is painting her support in a different light. "What's clear when you look at her statements and her approach to the problem, she was too willing to give the president a blank check. There's been a little bit of revisionist history since that time, where she indicates she was only authorizing only inspectors or additional diplomacy," Obama said in an interview with The Associated Press. "Unfortunately, political rhetoric aside, Senator Clinton has no specific plan to end the war in Iraq. Instead, she refuses to commit to a specific timeline for withdrawal and has made it clear that she will continue 'combat missions' in Iraq." Obama and Edwards have been criticizing Clinton daily on the war and on a recent vote to label Iran's Revolutionary Guard a terrorist organization and links threats from it to the war in Iraq - a stance they suggest could affect U.S. commitments in the region. "It's unfortunate that Senator Obama is abandoning the politics of hope and embracing the same old attack politics as his support slips here in New Hampshire," Clinton spokeswoman Kathleen Strand said. "Senator Obama is well aware that Senator Clinton will end the war in Iraq, opposes torture and has made clear that George Bush does not have the authority to attack Iran. Attacks on other Democrats won't bring about the change we need, but electing Senator Clinton will." Obama, in the interview, also took issue with Clinton's statements on torture. At one time, she had said that in some narrow cases torture could be acceptable to protect the United States. "The administration has tried to redefine torture in ways that would allow the CIA and other intelligence agencies to engage in brutal tactics that historically have been considered torture," Obama said Wednesday. "We have to have a very clear line. I agree with John McCain on this, that the United States government does not torture people. It doesn't yield good intelligence, and it weakens our ability to deal with human rights abuses around the world." "I think it's very important for any Democratic nominee to be very clear on this issue and not waffle," he said. Obama dismissed a question about why, if Clinton is so wrong on the war, he is trailing her in the polls. He also said he doesn't think war with Iran is inevitable before President Bush leaves office in January 2009. Obama criticized Clinton's vote in support of a bill that would designate Iranian special forces as a terrorist organization. He said that was something that I think many of us would agree" was correct, but he took issue with "language in the bill that would state that the structure of our forces in Iraq should, in some sense, be dependent on our need to check Iran." "I think the American people recognize that given the mistakes in Iraq, we have to operate with deliberation and caution. I think Iran is a grave and serious threat to peace and stability in the Middle East. I don't think it's acceptable for them to possess nuclear weapons," said Obama, who added that diplomacy hadn't yet been given a serious chance. "There is still time to do that, but we've got to have an administration that understands how to use those tools, and we haven't had that in this president," he said. A Republican National Committee spokeswoman said the three Democrats are missing the point. "While President Bush is working to win the war on terror and protect our country for future generations, the Democratic presidential candidates are grappling about who supported surrender first," Summer Johnson said.